Home » Can Solar Panels Work with Artificial Light? Solar radiation is the main source of energy used by solar panels to generate electricity. We can describe it as the transference of energy from the Sun through a set of electromagnetic radiations that are distributed in a light spectrum that goes from ultraviolet to infrared radiation. From the figure above, we can notice that the highest irradiance values can be obtained in the region of visible light. This region contains all the colors of the rainbow and includes wavelengths that go from 400 to 700 nm. Based on this approach, most solar panel manufacturers focus on maximizing the absorption of light within the visible region. However, solar panels can also be designed to absorb light in wider wavelengths. As we can see below, some of the most common solar panel technologies, like monocrystalline and polycrystalline modules, are able to cover a higher range of wavelengths including visible light. They can also include wavelengths in the near infrared region (up to 1200 nm). Other popular thin-film technologies such as CIGS and CdTe can also cover these regions, although with less efficiency. Amorphous (a-Si), Gallium Arsenide (GaAs), Dye-sensitized (DSSC) and Organic Solar Cells are mainly restricted to the visible region of light. Efficiency vs. wavelengths of different solar panel technologies. As you can see, there are other wavelengths of light that can also be used by large, commercially available technologies like silicon modules to harness electricity. Therefore, we can ask ourselves, is it possible that solar panels can harness electricity from other sources of light, like incandescent or fluorescent bulbs? An incandescent lamp is composed of a balloon of glass in which a filament is heated to high temperatures (2,000 to 3,000 K) and is generally defined within a spectrum of 300 -830 nm wavelengths, having its peak on the infrared region of light. Therefore, if solar panels can extract power from wavelengths as low as 300 nm to 1,200 nm, then it is logical to think that solar panels could extract some energy from this source. On the other hand, fluorescent lights were defined and designed to be located inside the visible region of light. There are many types of fluorescent lamps (around 12) that are designed using different technologies. However, most of them use gases that are electrically charged, like mercury, to create a path for a current to flow. In turn, this will lead a phosphor to fluoresce and create visible light. This technology focuses on the lower band of the visible light spectrum which produces low ultraviolet light. LED and metal halide technologies are also other common artificial sources of light. Metal halide lamps are high-pressure discharge lamps that use an electric arc in a gaseous mixture of vaporized mercury and metal halide to produce light in a broad spectrum. On the other hand, Light Emitting Diodes (LED) are solid-state lamps that use the electroluminescence of a bandgap (a barrier that limits electrons inside a material) to emit light. They can be divided into cool and warm technologies. According to a research study done at the Ghent University in Belgium, we can visualize the typical wavelength ranges of all artificial light technologies scaled to 500 lux. Ben Minnaert and Peter Veelaert from the Ghent University asked themselves the same question that we wondered ourselves. So, to find the truth, they put all of the artificial lights into different categories: incandescent, fluorescent, LED, and metal halide lamps. Then, they used different solar panel technologies like monocrystalline, polycrystalline, Cadmium Tellurium, CIGS, and others to quantify the power outputs of these modules under indoor conditions at 500 luxes (typical measure of the intensity of light in sq. meters inside offices) from the mentioned artificial sources of light. Amazingly, they found that it was indeed possible to harness electricity from artificial light through solar panels. However, efficiency values were nowhere close to what would be expected in outdoor daylight conditions. 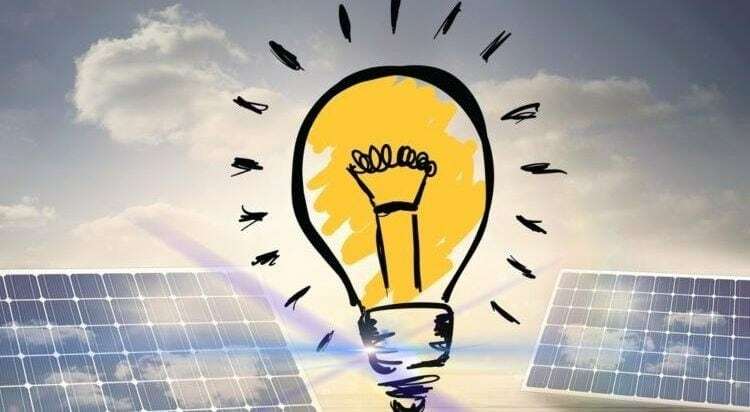 They found that the monocrystalline technology and incandescent light were the best possible combination to obtain electricity from artificial light, followed by polycrystalline and CIGS technologies combined with incandescent light. Nevertheless, taking into account a 500 lux illumination, it was possible to obtain only 6 W/m2, too low for Standard Test Conditions. Other sources of light like fluorescent, LED and metal halide were not as efficient with silicon cells, but instead with GaAs and CdTe solar panels. However, these technologies were not suitable at all since they were able to produce more than 1 W/m2. Based on this research we can conclude that solar panels can work with artificial light, but the efficiency obtained from using this source of light is so negligible that is not worth it to be considered as electrical supply. 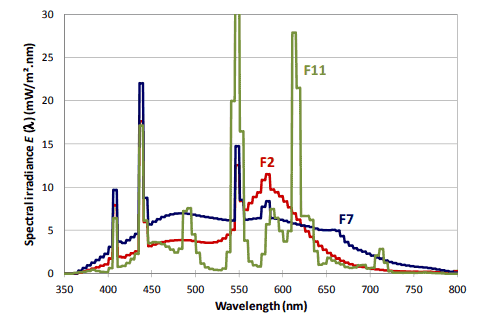 Moreover, if we compare the spectrum of irradiance from fluorescent sources of light with the solar radiation spectrum, we can notice great differences. Solar radiation spectrum curve follows a smooth and continuous shape that maximizes the conversion of light into electricity. We can notice that by multiplying the wavelength in nm. with the spectral irradiance in W/m2, we can theoretically obtain values of 1000 W/m2. 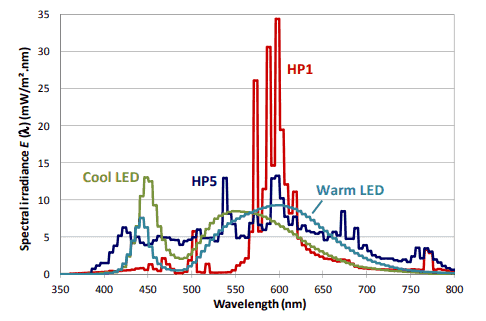 However, when we compare it with the fluorescent, LED, or metal halide spectral irradiance, we can notice that many of them have irregular spikes that do not allow a smooth absorption of light. Besides, these values are in mW/m2 rated at 500 luxes. When we multiply them with the wavelengths in nm., we obtain values lower than 30 W/m2. The difference is just astronomic. For applications inside commercial buildings related to BIPV, illuminance values can increase, however, they will not be as attractive as to consider installing solar panels to take advantage of artificial light. As a reference, a UEFA Champions League Stadium can have an average illuminance of 2,000 luxes, and if you multiply the estimated 30W/m2 at 500 luxes by four (to achieve approximately 2,000 luxes), then you would only be obtaining around 120W/m2 irradiance values, which is still very low.